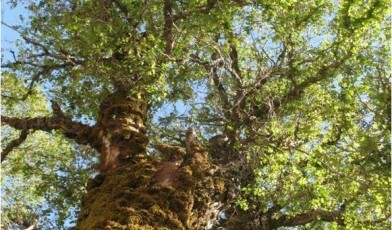 Zelkova abelicea is one of the most prominent Tertiary relict trees of the Mediterranean region, and is therefore of considerable ecological importance. Endemic to the Greek island of Crete this species is found in open mountain forests between 900 and 1,800m. It normally grows as a medium sized standard tree (10-15 m tall) but shrubby dwarfed individuals, with dense growth and smaller leaves, are very common due to grazing. This species is able to propagate vegetatively by suckers sprouting from roots which may also explain the relatively dense thickets formed by Zelkova in the wild. There may be thousands of dwarf individuals found on the island of Crete but only very few stands of mature trees have survived and these are severely fragmented. These trees, often hundreds of years old, are vitally important for the survival of this species because it is these trees which are able to reach maturity and produce seeds for the next generation. The most significant threat to this species is the overgrazing and browsing by goats and sheep. Livestock destroy seedlings and saplings hindering the species’ development to fruiting and they also cause soil erosion by trampling. Fires are also a major threat to the Zelkova trees, and the other vegetation of Crete in general. An increase in pruning of branches to make walking canes has also had an effect on this species, as has the use of Zelkova for firewood. In situ conservation should include fencing of areas to exclude grazing and long term scientific investigations in close collaboration with shepherds and other local stakeholders. Populations of highest conservation priority are: (i) the only population of the Thripti Mountains and both remaining populations of the Psiloritis Mountains, (ii) Kedros, and (iii) Rouvas Forest. Well documented collections of this species, from each of the mountain regions, should be established in botanic gardens in Greece.